The Caribbean has long since been a mainstay to visit, and it’s easy to see why. 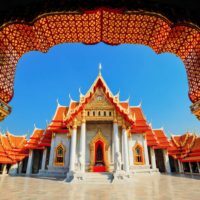 Beautiful beaches, stunning landscapes and totally rich culture are only some of the amazing reasons that make this area of the world so unique. This is especially true when it comes to the best things to do in St Lucia. When I was in Antigua, the driver we hired for the day (who’s from Antigua) kept telling us about how amazing Antigua was but said that in more recent years, St Lucia had taken over Antigua as one of the most sought after destinations to visit in the Caribbean. 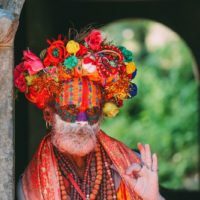 With that in mind, I had to show you some of the best things to do in St Lucia on your next trip to the Caribbean. 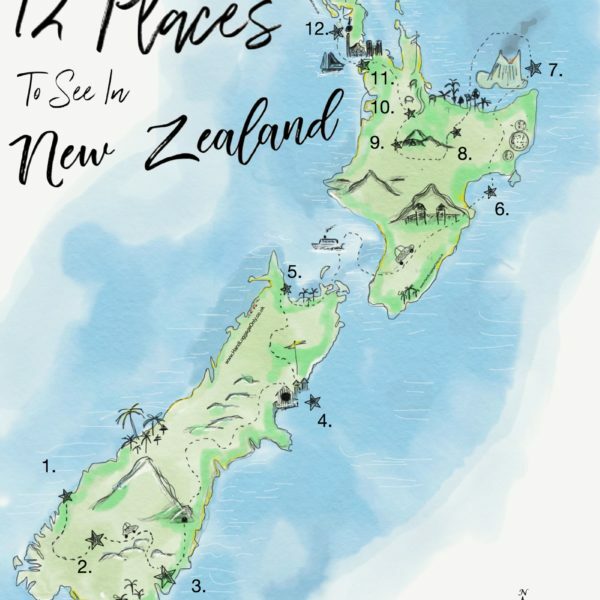 Now while that fact might be very much up for debate, it’s safe to say there are many-a-reason why you need to visit the stunning island of Lucia. 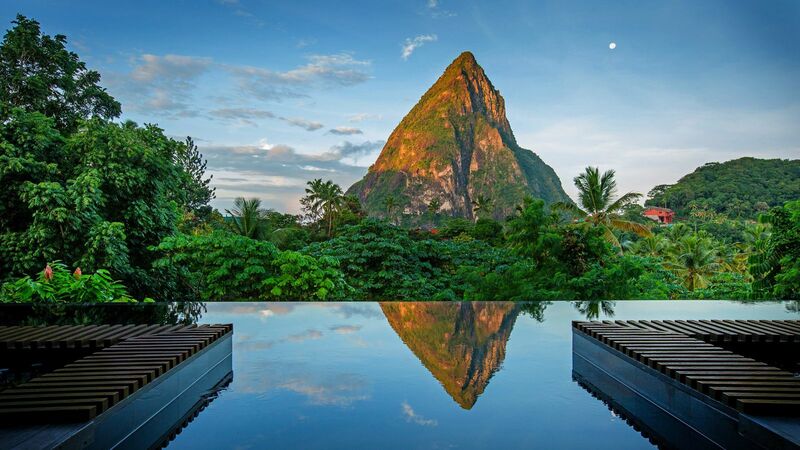 Take a look, below, at some of the best things to do in St Lucia. Have the best trip. 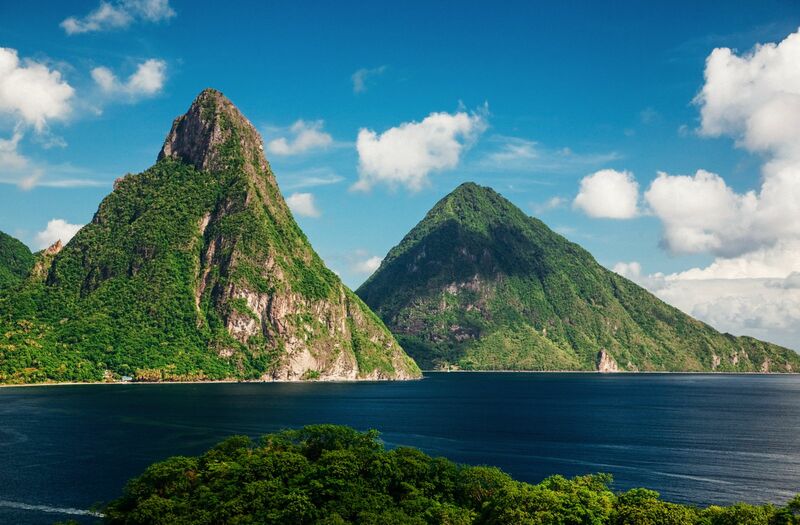 The twin volcanic peaks of Pitons rise up from the ground like two great ogres (albeit, some mighty fine ones!). 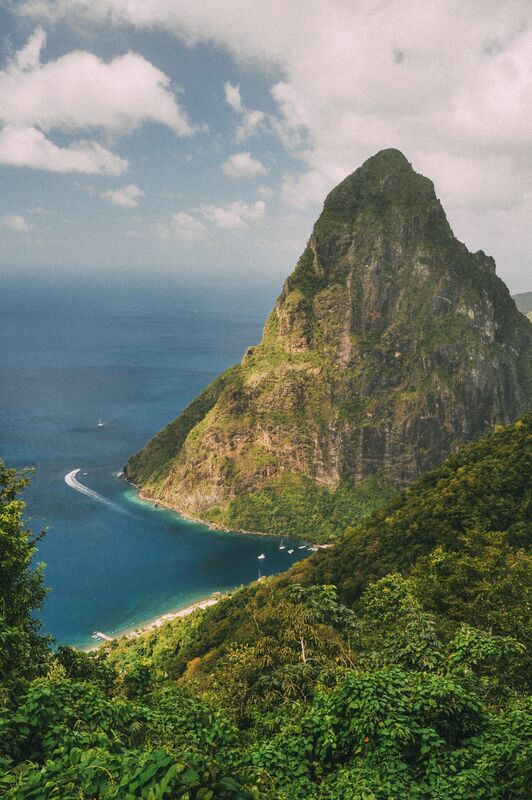 One of the most beautiful sites on the island, no trip is complete without coming to see Pitons. 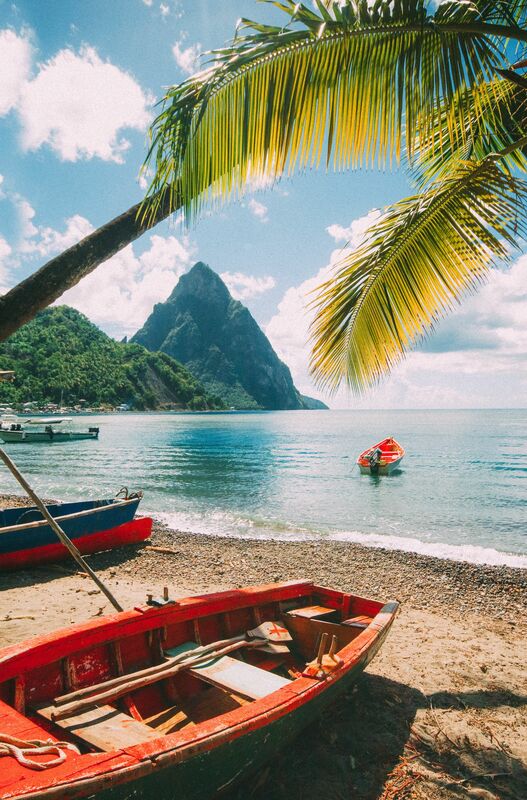 It really is one of the best things to do in St Lucia. If you’re feeling extra energetic, there’s a whole range of hiking trails the criss-cross this area of the island. It’s a great way to see another side of the Carribean and totally unique. 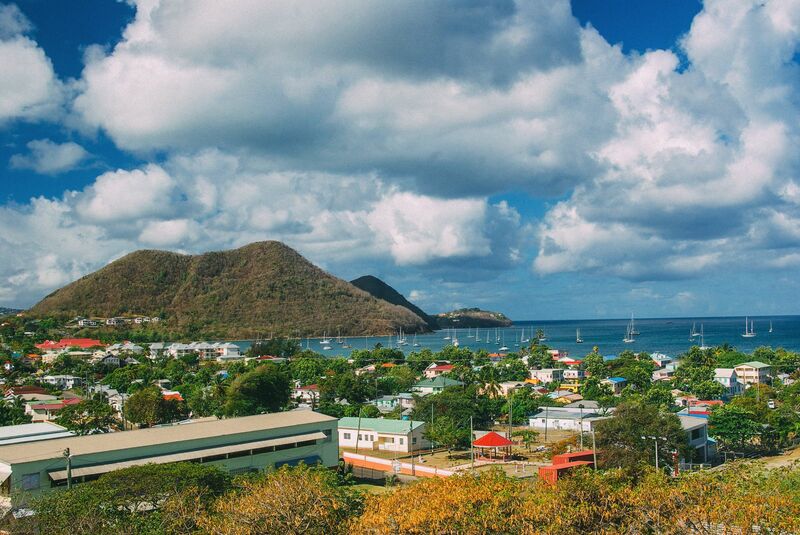 The fascinating fishing village of Gros Islet is an easy boat ride away from Rodney Bay (St Lucia’s primary beach). With rum shops and fishing shacks lining the historic streets and tangled fishing nets drying in the sun, Gros Islet makes a fantastic spot to come and get a glimpse into genuine island culture. Head here on a weekend, chill out and relax into the island vibe! 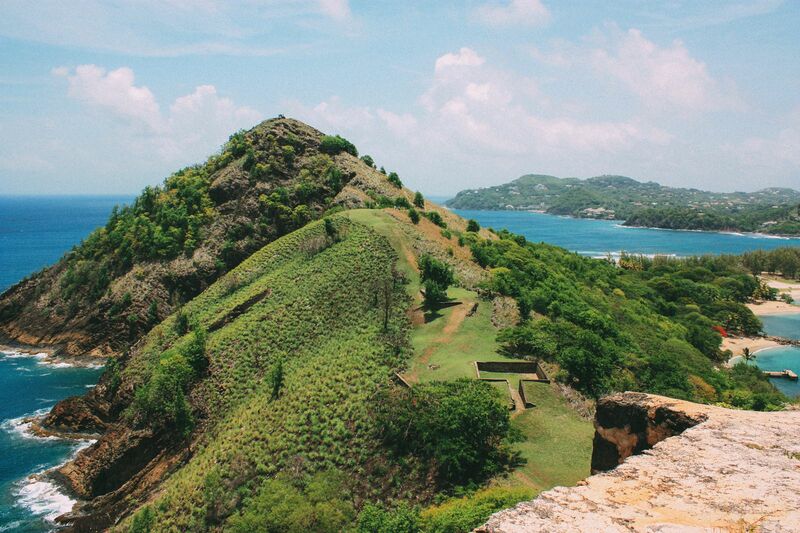 This little island was once used by pirates to raid passing ships and was joined to the rest of St Lucia in the 1970s. 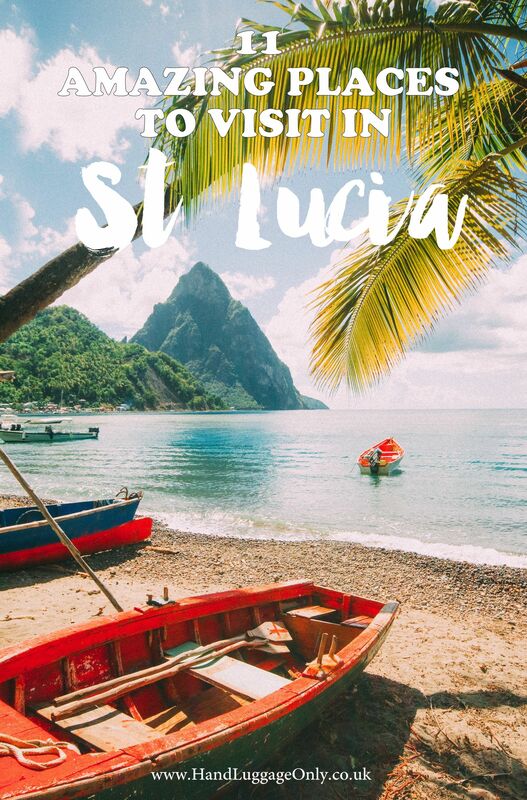 Its lush, tropical typography is as beautiful as any other part of St Lucia (except perhaps more intimate) and it’s also dotted with points of historical and cultural interest, making it well worth a visit. It really is one of the best things to do in St Lucia. Sandwiched between coral sands and hypnotically green coastal jungle, Anse Mamin is one of those rugged Caribbean tropical paradise photos that you see on postcards – it’s the like perfect mix of jungle and beach. This is one of the loveliest beaches on the island and not a bad spot to spend an afternoon (and to grab a bite to eat). Just make sure to take lots of sunblock, the sun is strong on the island. If you can bear to tear yourself away from relaxing on the beach (or by the pool with a cocktail-in-hand), the community-run Tet Paul Nature Trail is one of the prettiest (and easiest) hikes on the island. Make sure to pack some comfy shoes as it’ll make the trails much easier. 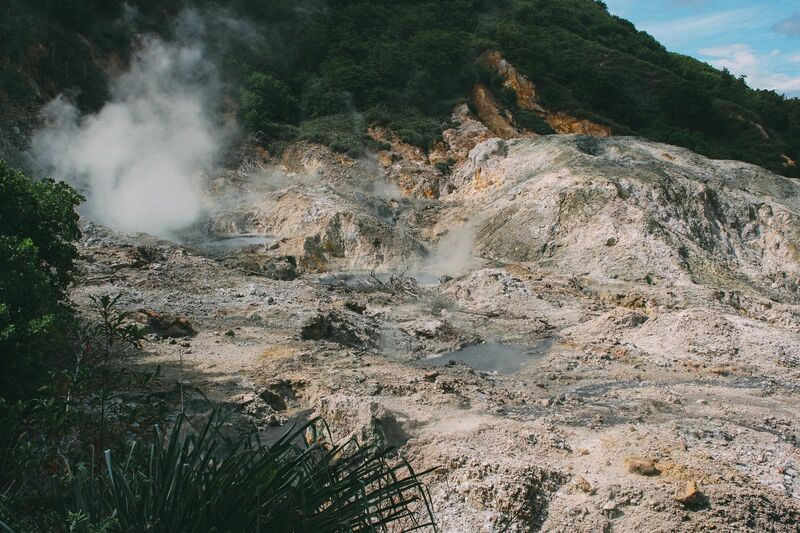 This is the hottest and most active geothermal area in the Lesser Antilles and is famous for being the Caribbean’s only “drive-in” volcano! It is an important site for historians who believe that the entire Caribbean basin was founded here. Tours to the springs will take you through the crater and past tranquil pools and hissing hot springs. It really is one of the best things to do in St Lucia. 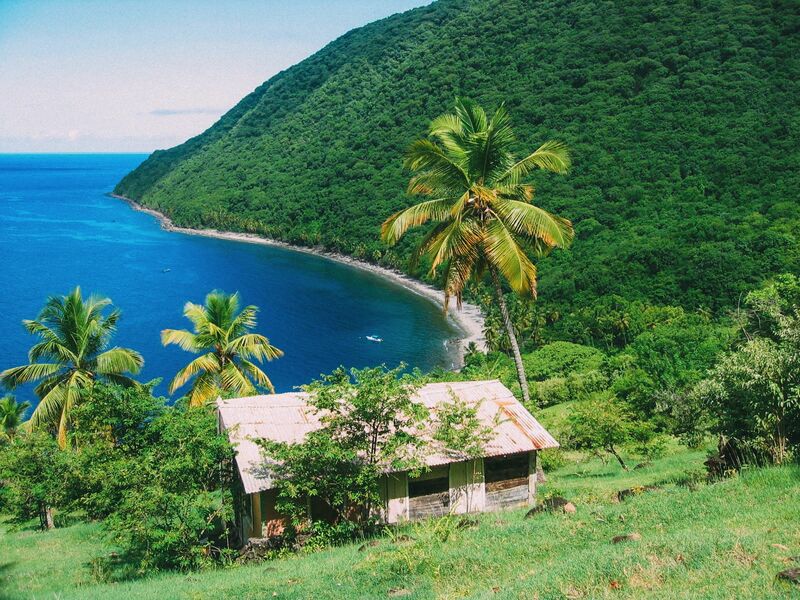 Soufriere is known as the beating heart of the island and combines colonial-era grandeur with brightly painted wooden sea shacks. The bustling action on the seafront, with the fishermen chatting away as they untangle their nets and women selling tropical fruit to passers-by makes Soufriere a worthy stop on any itinerary. Deeply set into the island, locals joke that Marigot Bay is an astounding feat of Mother Nature’s architecture thanks to its abundant sheltering shade. It’s beautiful waters and stunning sight make it the perfect place to set up camp and relax for the day or to explore lots of the nearby beaches. Honestly, it’s one of those places that just lets you chill and really lean into that infectious island vibe. With an infinity pool that disappears out into the jungle and splendid views of the surrounding mountains and volcanoes, this hotel combines high-end luxury with eco-lodge chic. 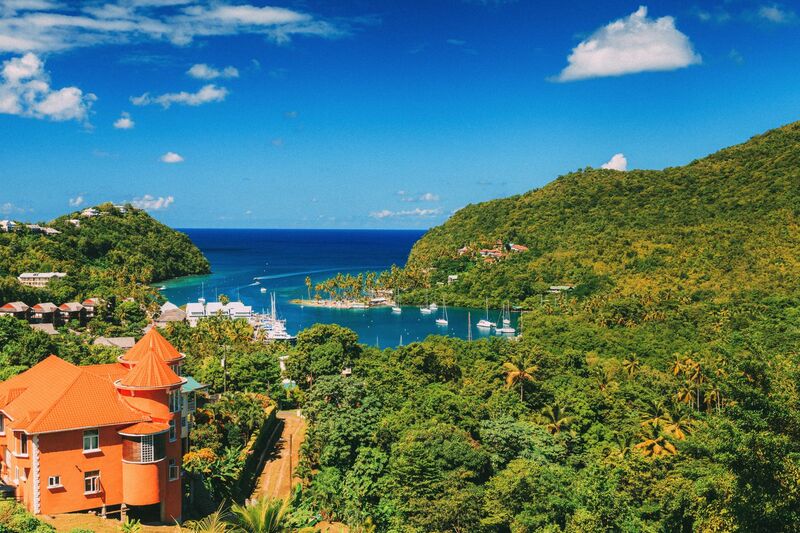 The whole vibe makes you feel like you are staying in a tree house with one of the most iconic views of the island. Once you’re here, make sure to spend some time in their spa and pool – it’s an iconic part of the hotel and totally unique. 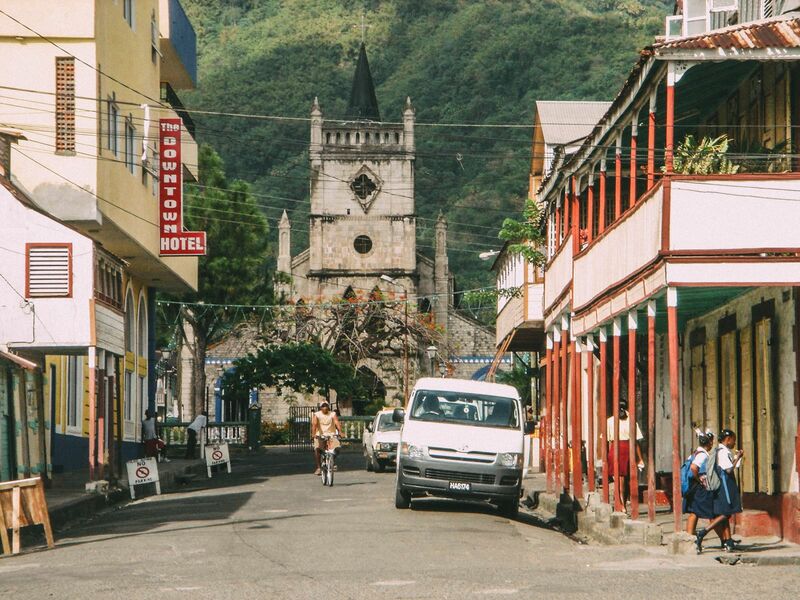 This neo-gothic church in the centre of Soufriere is the island’s most impressive religious monument. 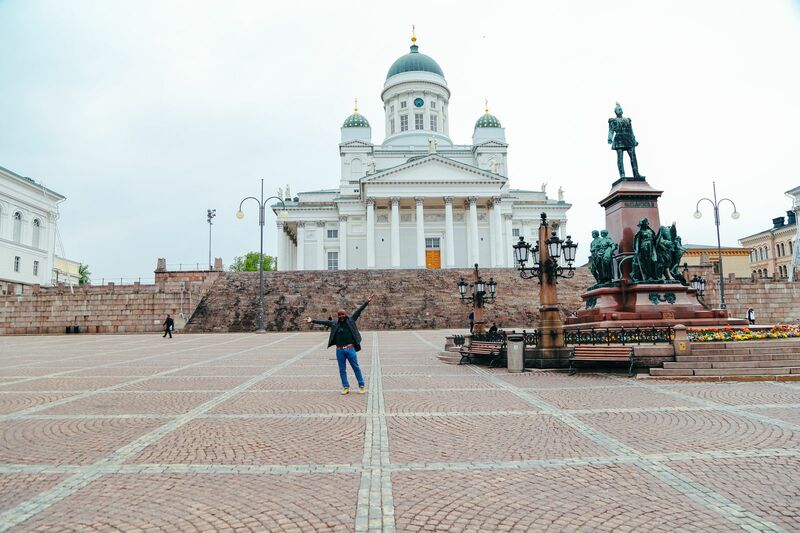 The interior, with its polished wooden benches and stunning stained glass windows, makes an interesting cultural excursion and is located near some beautiful, old wooden houses. People from all over the world come to St Lucia especially to visit Zion Lion Farm, a fabulous eco-reserve that serves up some of the tastiest food on the island. You can arrange to do a tour of the farm to find out about the island’s culinary history while learning about sustainable living practices. 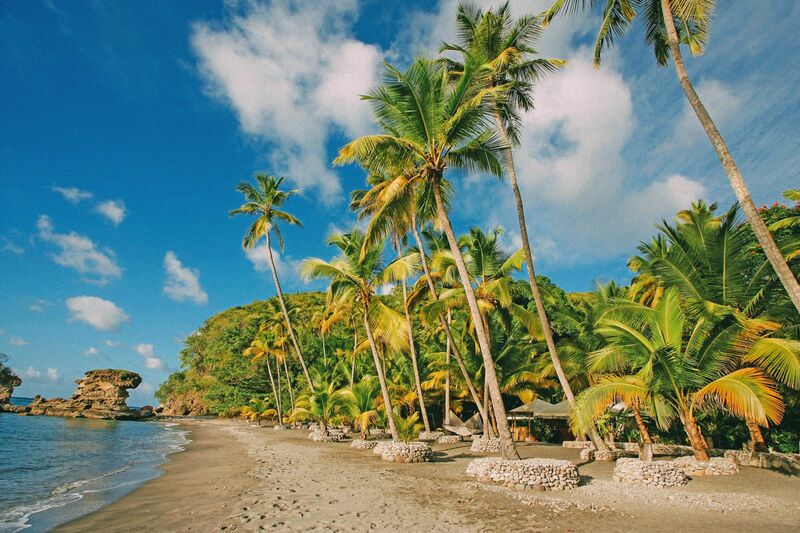 The whole island of St Lucia is totally stunning, and Zion Lion Farm is no exception.